Watch the video for “Ninety Nine Cent Dreams (ft. Big Daddy Kane)” HERE! 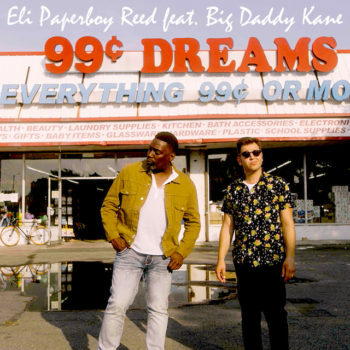 Eli Paperboy Reed’s new single, “Ninety Nine Cent Dreams,” featuring legendary rapper Big Daddy Kane premiered over the weekend on Elton John’s Apple Music Beats 1 Radio Show. Now available at all digital service providers, check out the official video shot in New York City. “Ninety Nine Cent Dreams” (feat. Big Daddy Kane) reflects Reed’s vision of the ideal summer afternoon in New York City, complete with a high-energy, soul-infused narration. Reed created the track, leaving a space for Kane to add the final touches. Eli later referred to the track as “perfect,” commending his long-time role model for capturing the essence of the song and writing the verse that brought it all together. Eli Paperboy Reed and Big Daddy Kane’s friendship began as every modern friendship does – on Instagram. Kane called out Reed as one of his current ‘Top 10’ favorite singers, and the rest is history. Over the years, the two artists formed a close friendship over shared music tastes, discussions of new ideas, and a huge amount of respect for one another as musicians. From humble musical beginnings growing up outside of Boston, Reed moved to Clarksdale, Mississippi when he was 18, and cut his teeth playing and singing in juke joints all over the Delta. From there he took the well-trod path to Chicago, where he spent a year as minister of music with Southside church of Soul legend Mitty Collier. Soon after returning to Boston in 2008, he released his first full-length studio album, Roll With You. Come and Get It (2010) and Nights Like This (2014) followed, with Reed and his band impressing audiences on five continents. In 2016, he returned to the studio for his Yep Roc debut, My Way Home. Watch/Share: “Ninety Nine Cent Dreams” ft. Big Daddy Kane HERE! Eli Paperboy Reed’s “99 Cent Dreams” available for pre-order!